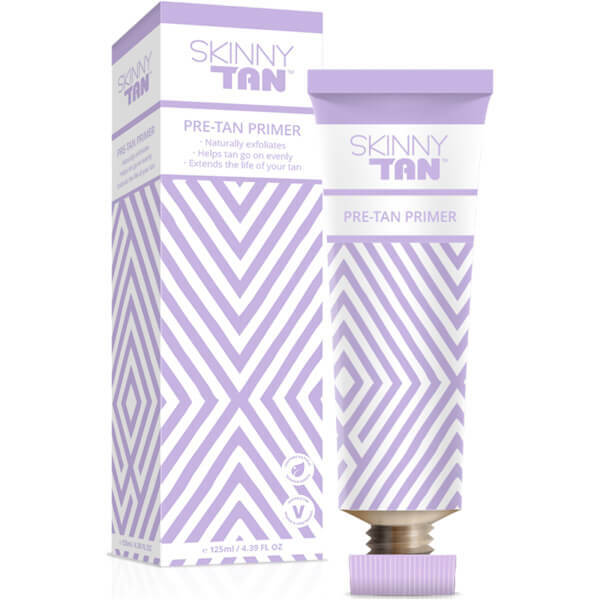 Prepare skin for self-tanning with the SKINNY TAN Pre Tan Primer; an exfoliating formula that ensures skin is perfectly smooth before applying false tan. Effortlessly smoothing over the body, the primer utilises crushed Walnut Shell to eliminate dead skin cells from the body, whilst thoroughly hydrating skin to prevent dryness. Once skin is fully prepared, self-tanning products can glide evenly over the body, resulting in a flawless, streak-free finish. Use the primer to prep the skin a few hours before tanning, utilising the Skinny Tan Exfoliating Mitt to create the ultimate base for your tan. Purified Water (Aqua(, Caprylic/Capric Truglyceride, Stearic Acid, Juglans Regia (Walnut) Shell Powder, Glycerin, Cetearyl Alcohol, Triethanolamine, Phenoxyethanol, Caprylyl Glycol, Bentonite, Potassium Cetyl Phosphate, Parful, Xanthan Gum, Disodium EDTA, Coumarin.